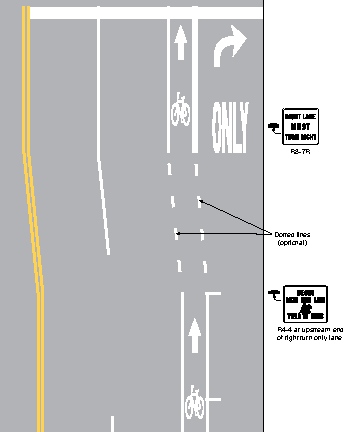 The diagram is the standard MUTCD/CA-MUTCD figure showing how a bike lane should be handled with a dedicated right turn lane. Though this diagram is considered by many advocates to be outmoded, it at least shows the bike lane as continuing through the merge zone and does not give precedence to either bicyclists or motor vehicles. It is much better than what Sac County painted. 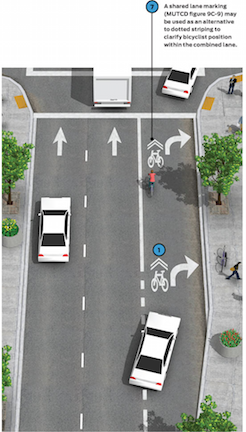 Even better is the NACTO Design Guide for Urban Bikeways, shown in the diagram at left, with a MUTCD-like similar diagram to the right. 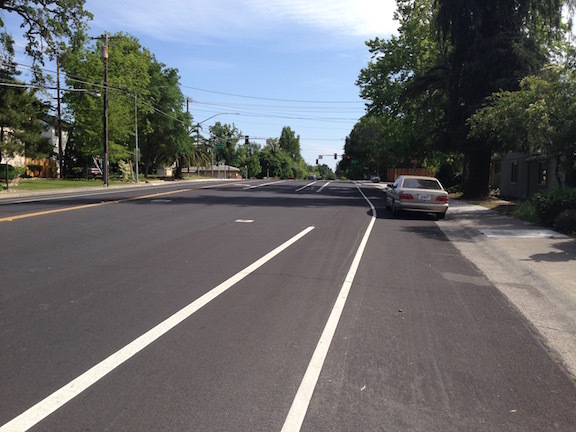 Many enlightened places are now using NACTO designs, and they are permitted to do so both by the Federal Highway Administration (FWHA) and Caltrans. But instead of looking to the MUTCD or NACTO, the county painted something that makes clear their disdain for bicyclists.